Continuing with Dutch, Flemish and French butter in paintings from the 17th, 18th and 19th centuries. The butter in a mound shape is from Pieter de Hooch's A Woman Preparing Bread, (Dutch c1660) in the Getty Museum. 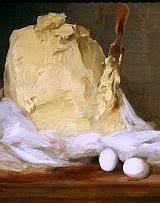 Mound of Butter by Antoine Vollon (French, c1875) in the National Gallery of Art. Butter curls or slices with cheese and bread in Still Life with Ham by van Schooten (Dutch, d1655) Kroller-Muller Museum. Butter or Cheese? What do you think? After my first post on 17th century Dutch and Flemish butter in art, HERE someone commented that it was cheese. The lady with the imprinted shapes, by the French engraver Nicolas Larmessin (d1694), is called la Beuriere – and Beurre is French for butter. Peter Rose, who has studied Dutch paintings and cooking for decades and is the authority, kindly responded to my email and said they were butter. In a couple of the paintings butter is next to pancakes and waffles, which then as now were eaten together. Butter was printed with various designs to distinguish the seller or for decorative purposes, and was made in different shapes. While I have made butter for many years, I have only made a few types of cheese and can’t imagine any of those cheeses having a ‘print’ on every top. Or how they made the cheese with the two long end points. The texture, color and sheen of butter are different from cheese. Butter packed in cloth (as seen with some in the first post) is also in a Lewis Miller image and in early writings. Thomas Moore’s 1803 refrigerator HERE held 22 one pound bricks of butter each wrapped in "linen cloths as usual." Enjoyed this post. The paintings are actually quite beautiful for mundane butter! I love the historic aspect of food. Thanks, much! I too have done much research on these. I concluded they are mostly cheese as well. Here 2 links as some of my reasons why. These are modern cheeses many still made in traditional manner and in the same shapes we see in the paintings. Interesting topic so many options. The Polish cheeses in the photographs are wonderful, especially the cylinder or ‘spindle-shape’ ones with a hole down the center. I had never heard of oscypek (smoked sheep milk cheese) before, lovely. They seem darker and ‘harder’ looking, at least the outer surface.